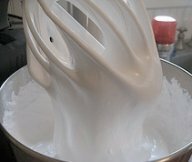 My homemade marshmallow recipes range from homemade marshmallow fluff to marshmallow frosting and marshmallow cake filling. So yummy and easy to make. Offering many old fashioned dessert recipes for you to try. This marshmallow recipe for fluff is perfect to use for filling a cake too. Mix together sugar and syrup; bring to a boil. Remove from heat and stir in gelatin which has been softened in cold water. Chill mixture until cold and very thick. Beat 6 to 8 minutes with a mixer on high speed until very fluffy. Yum. Boil sugar and water to 238 degrees; add chopped marshmallows, but do NOT stir. Pour hot syrup over beaten egg whites, then add baking powder and lemon juice. Continue beating until mixture forms a peak; spread between layers of cake, on top and sides. Sprinkle with coconut, if desired. This is very light and refreshing. You may just use red cherries, if you cannot find the green ones (just festive for the holidays). I have also used fresh bing cherries and it was delicious. Cut cake once or twice horizontally. Melt the marshmallows in pineapple juice; set aside to cool. Whip cream stiff; add pineapple. Add remaining ingredients and fold into marshmallow mixture. Spread between cake layers and on outside. Melt the chocolate bars, marshmallows and milk in a double boiler; cook until it achieves spreading consistency. Fold in 1 cup of whipped cream. Slice cake into 5 layers and spread whipped cream mixture between layers. Chill for at least 8 hours. Combine remaining cup of whipped cream with the sugar and vanilla. Frost top and sides of cake with it. Chill for at least 30 minutes before serving.